John Bercow's bombshell decision on Brexit prompted fury and disgust among his many enemies, with one branding him 'Humpty Dumpty'. He clashed yet again with his long-term parliamentary adversary Andrea Leadsom after blocking the Government's plans for a third meaningful vote this week. And he faced scorn from senior figures including Prisons Minister Rory Stewart and Solicitor General Robert Buckland. Mr Stewart who had already expressed his disagreement with Mr Bercow, appeared to compare the Speaker to the egg-based nursery rhyme character. This is thought to be a reference to Mr Bercow citing 'precedent' as a reason for blocking the meaningful vote plan today. 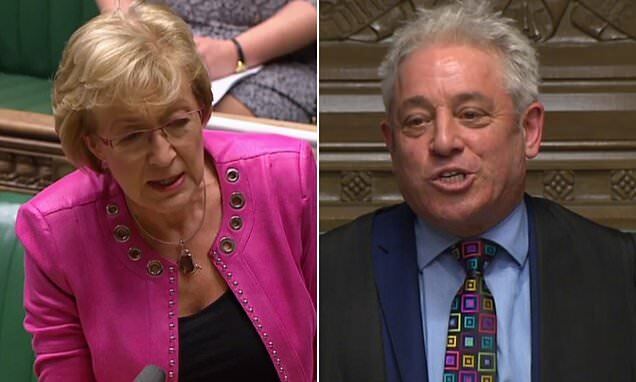 The Speaker has had an acrimonious relationship with Commons' Leader Mrs Leadsom since she took up the post over issues including bullying of parliamentary staff. He admonished her today for fiddling with her mobile phone during points of order, prompting her to take revenge by questioning his impartiality and ability to find a solution to the mess his ruling on a third meaningful vote had made. Mr Bercow had replied to a request from Kingston MP Sir Ed Davey for a 'Speaker's Conference' to help solve the constitutional pinch-point by saying the last time he offered to hold one there had been little interest from her predecessor, David Lidington.